01.25.19 11:45	Account	Transfer	-70.00	Sent Payment: 70.00 USD to account U15868647 from U4731311. Batch: 243881481. Memo: Shopping Cart Payment. 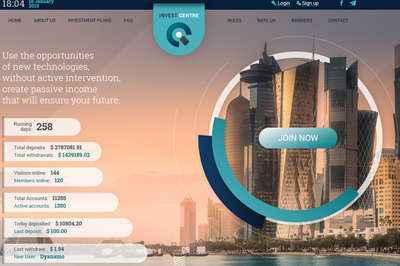 Deposit to Invest Centre User monitorinvestnet. 01.26.19 13:45	Account	Receive	+2.8	Received Payment 2.8 USD from account U15868647 to account U4731311. Batch: 243993227. Memo: API Payment. Withdraw to monitorinvestnet from Invest Centre. 01.28.19 18:19	Account	Receive	+0.5	Received Payment 0.5 USD from account U15868647 to account U4731311. Batch: 244226004. Memo: API Payment. Withdraw to monitorinvestnet from Invest Centre. 01.28.19 05:57	Account	Receive	+7.8	Received Payment 7.8 USD from account U15868647 to account U4731311. Batch: 244143867. Memo: API Payment. Withdraw to monitorinvestnet from Invest Centre. 01.29.19 09:34	Account	Receive	+3.8	Received Payment 3.8 USD from account U15868647 to account U4731311. Batch: 244285308. Memo: API Payment. Withdraw to monitorinvestnet from Invest Centre. 01.30.19 16:31	Account	Receive	+4.55	Received Payment 4.55 USD from account U15868647 to account U4731311. Batch: 244456736. Memo: API Payment. Withdraw to monitorinvestnet from Invest Centre. 01.29.19 17:57	Account	Receive	+1.25	Received Payment 1.25 USD from account U15868647 to account U4731311. Batch: 244344809. Memo: API Payment. Withdraw to monitorinvestnet from Invest Centre. 02.01.19 05:16	Account	Receive	+4.05	Received Payment 4.05 USD from account U15868647 to account U4731311. Batch: 244617870. Memo: API Payment. Withdraw to monitorinvestnet from Invest Centre. 01.31.19 13:03	Account	Receive	+1.00	Received Payment 1.00 USD from account U15868647 to account U4731311. Batch: 244547050. Memo: API Payment. Withdraw to monitorinvestnet from Invest Centre. 02.01.19 20:35	Account	Receive	+1.25	Received Payment 1.25 USD from account U15868647 to account U4731311. Batch: 245051979. Memo: API Payment. Withdraw to monitorinvestnet from Invest Centre. 02.02.19 20:36	Account	Receive	+2.8	Received Payment 2.8 USD from account U15868647 to account U4731311. Batch: 245155006. Memo: API Payment. Withdraw to monitorinvestnet from Invest Centre. 02.03.19 20:20	Account	Receive	+4.05	Received Payment 4.05 USD from account U15868647 to account U4731311. Batch: 245250152. Memo: API Payment. Withdraw to monitorinvestnet from Invest Centre.